Christmas break officially ended this week, even though it was a short week due to "birthday break". Amber's 11th birthday is tomorrow, January 12th! We had plans for Amber to spend the night with my mom on Wednesday into Thursday afternoon, and for a small birthday outing with a friend on Friday, making it an awkward start to the semester. Given all the birthday plans, we started back to school this week slowly, and very reluctantly on Amber's part. A night with my mother seems to have adjusted her attitude though, as she returned a much more compliant child. My sister has noted this same phenomenon with her children, they are always returned much better behaved than they left. 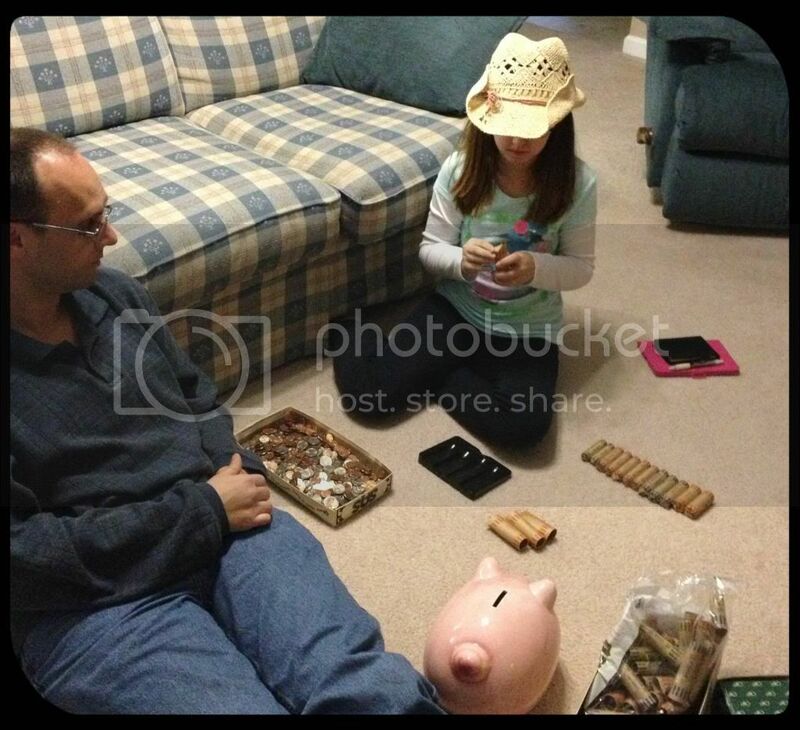 A birthday tradition, counting the coins for deposit in Amber's piggy bank. It literally is a pig. Things are changing this semester with some of our curriculum and subjects, but there was no point in starting everything new during our 2.5 day week. I did opt to begin the new poetry portion of literature this week, and thankfully Amber enjoyed those lessons even doing more than assigned. I'm glad that worked out well because I can't imagine that the addition for next week, Writing With Skill, is going to be as thrilling. The subjects this week consisted of Religion, Math, Poetry, History, Latin, and Science. History was just a read and move on week. The next two chapters in our book were topics that Amber's parochial school covered in great detail first semester last year. I didn't feel it was necessary to do more than read over those chapters. Amber spent a couple of long car rides reading, and that was history this week. Latin's review chapter was a priority for us this week. Unfortunately, whenever we had busy weeks last semester, Latin was usually the first subject to be pushed aside for later. I was relieved to see that Amber remembered most of the items in the review chapter, even though she did all the work before Christmas break. This semester Latin is going to be given more precedence when time gets tight, and we are dedicated to finishing this level of Latin by the end of the semester. In Science we are finally to the fun stuff, at least to us, Electricity and Magnetism. That Amber loves playing with circuits so much makes this physics mom overjoyed. We studied basic electricity and magnetism last year, however this year it is more indepth. We purchased a couple of small Snap Circuits kits for science last year and found them so much easier to use than the old fashioned wire, battery, and light demonstrations. Circuit building with Snap Circuits and working on her circuit design. This year we have a much larger Snap Circuits kit allowing for larger demonstrations and experiments. Amber had one assignment this week where she needed to arrange two lights in a circuit in such a way that if you removed one the other one would still work. Fairly simple, if you know about series and parallel circuits. Evidently, Amber remembered from last year because she went right to drawing her circuit on the experiment sheet and she drew a perfect parallel circuit. Her execution of the design in the Snap Circuits needed a little help though. Still, she had the idea down and we were able to make it work. Amber spent all week playing with the Snap Circuits, building her own and creating designs in the provided book. She made a space alien siren, light sensitive light switch, learned the use of resistors, and made a type of volume switch for the blaring alien siren. This week Amber also learned a new craft, loom knitting. She absolutely loves it, and bounced between circuits and knitting in her free time. 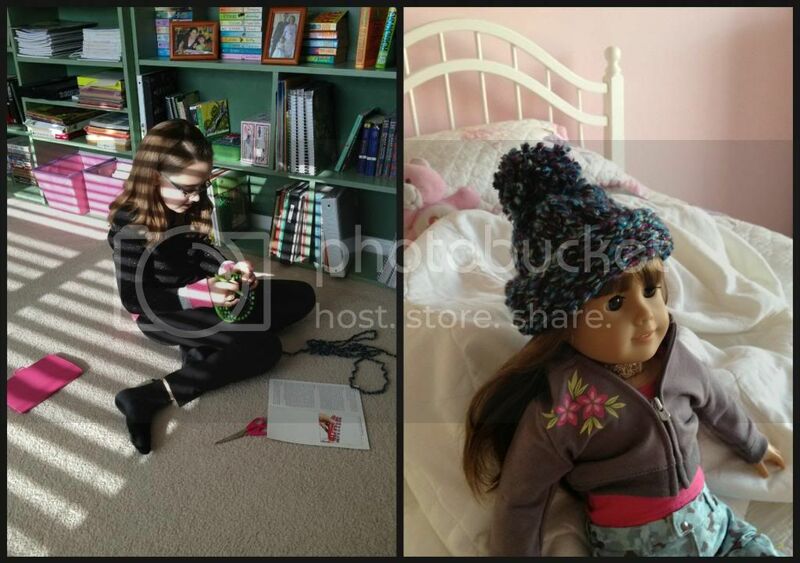 So far she has knitted hats & scarves for American Girl dolls, and a couple of baby hats. Loom knitting. She made the doll's hat, among other things. Our personal service project this year is newborn and premature baby handmade items, such as knitted hats, booties, and blankets. We are working with two different organizations to benefit the children's hospitals in our area. This is exactly the type of project we have been searching for. Amber is thrilled to finally participate in a service project where she gets to actually do something, instead of collecting money or items from others. Hopefully her enthusiasm does not wane too much over time. That was our not so illustrious start to second semester of 5th grade. I'm praying that Amber can calm down after the weekend of birthday celebrations for a better academic side to next week. It's a long shot, but I can hope. I think the age of 11 is hard. It's been a year of perpetual attitude adjustments here, and I've learned to lower my expectations. We're close to 12 now and things are evening out, but I know these will be some rocky years. Happy Birthday to Amber, and here's to a productive school week next week! I'm glad to hear that it will eventually even out. Amber has the added bonus of sensory processing disorder, so there are times that she is very difficult on top of normal "nearly 11 year old" stuff. I swear, I'm never letting that child stay up late again. It took about 10 days to get her back to an even disposition after New Year's Eve. What another great week Christy. I am excited to see what you all do on Amber's birthday. Kei sent her a little package, it may not be there until Monday though. I want Snap Circuits for Kei! Everything I have read about them sounds awesome. LOVE the doll's hat! Very cool. I am so glad to have my computer back. I feel so out of whack without it even with the iPad. Happy weekend friend!! Oh, I know what you mean about the computer. Mine died the day after Christmas, it was a dark day for me. It was our network hub too. Thankfully, I had both a tower and a laptop computer, but Amber had taken my laptop last year when her computer got just too old to do anything. I took back the laptop and put my needed stuff on it. Our network has been a bit messed up though. It is hard to share computers after NEVER sharing a computer with anyone. Also, the laptop doesn't feel like "home". My new tower just arrived last night, but it isn't even out of the box yet. I won't have time for days to set it up. At least it is here and not still in that awful limbo "production" status. Sounds like an all around good week. Happy Birthday to your daughter. It was birthday week at our house too! We have Snap Circuits and my girls really like to use them.